After $4 became a reality in the summer of 2008, there has been a progressive push to build smaller, fuel-efficient cars for the U.S. market. Advocates, like author Thomas Friedman, have dedicated significant pages to greening the US car industry by raising CAFE standards and promoting more Euro-like auto choices instead of behemoth SUVs. 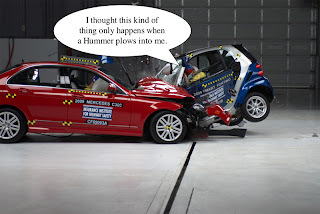 So it was a bit disheartening yesterday to read about some rather poor crash tests performed by theInsurance Institute for Highway Safety (IIHS). They reported that three popular small cars - SmartForTwo, Honda Fit, and Toyota Yaris - all received a Poor rating when in a front, off-set crash with a midsized sedan. From Kicking Tires: "What these fresh results from IIHS spell out is that in a frontal collision, physics dictate that the larger vehicle in the test will fare better than the smaller one. Force is distributed unevenly, making the small car lose out in any matchup versus a larger car. Crash statistics prove this to some degree. In 2007, small-car crashes resulted in a 17% higher fatality rate than midsize-car crashes." One company was especially irate about the test they criticized saying, "IIHS devised a test that no automaker has designed to and that they claim only represents about one percent of real world accidents." The site also provides product details about the safety measure Smart has taken with the car's technology and design. I also found in Smart's press release to the IIHS study that the promoted this site as a more informed response to IIHS's approach. Toyota ignored the report, from what I can tell; however, their online Toyota Community did not. Someone started a threaded discussion entitled, "What is 'wrong' with these new subcompacts?" where several people shared their thoughts on the topic. Alicia_at_Honda on Twitter did not comment on the story nor did Honda release any statements on the Honda USA website. The good news for Toyota and Honda (and Smart too) is that other outlets are responding to the study with contempt. Some reader comments on blogs found it interesting that no American car company cars were featured, like the Chevy Aveo. This lead to comments like this on Edmunds, "I wonder if this is an attempt either by the media or domestic manufacturers to smear foreign automotive manufacturers." Motor Trend had another theory: "Yes, our highways would be safer if we removed anything smaller than a midsize car, and larger than a half-ton pickup, too. Buses and semis included. Of course, IIHS doesn't expect that to happen -- it doesn't want that to happen. It simply wants to make sure that the money you save by buying a small, fuel-efficient car goes into the pockets of your auto insurance company."